I don’t believe there are many smartphone users who can say that they have never been embarrassed as a result of accidentally sending a regretful text message to their friend or colleague. Many of us type the message in a hurry and instinctively hit the ‘Send’ button without reading its content. It is when the message has been sent that our brain actually decides to read what we typed, but at that point there’s nothing we can do about it. On iPhone and iPad the situation is worse as there is no easy way of canceling the delivery of an iMessage or SMS after you have tapped on the ‘Send’ button. Luckily for us, a new Cydia tweak called DeLe adds a user-specified send delay to the message, during which you can read and reread the message and cancel if it has a spelling mistake, grammar mistake or contains a joke that you have finally realized is inappropriate for its audience. 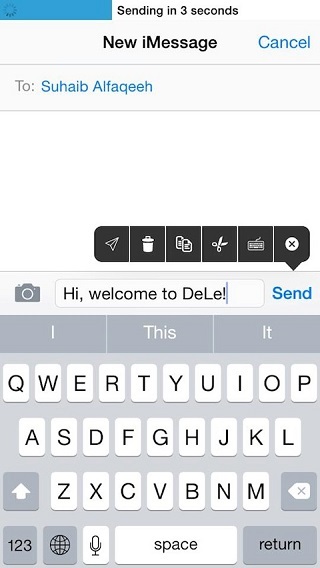 Using the DeLe tweak you can add a send delay of 3 to 10 seconds and cancel the sending process during this time. You can also edit the message to correct any mistake and send it again instead of retyping the whole thing. The tweak displays a progress bar on the top showing when your message will be sent. In addition to the send delay feature DeLe also adds a useful popup menu that has buttons for airplane, trashcan, clipboard, scissors and keyboard options. Using the Airplane button you can send a message instantly without the pre-defined delay, this is useful when you want to send the message urgently. Trash button lets you stop the message from being sent and deletes it right away. The Clipboard button lets you copy the content of the message so you paste and edit it anywhere you like, while still sending the message as it is. The Scissors button cuts the text message while stopping it from being sent. Finally the Keyboard icon lets you remove the keyboard from the screen so you can read the conversation easily. DeLe tweak for jailbroken iPhone, iPad or iPod touch is available in Cydia for $2.99 under the BigBoss repo.